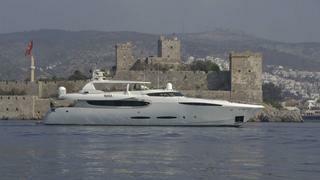 This stunning motoryacht has been built of top quality but light weight E-glass & epoxy composite material. 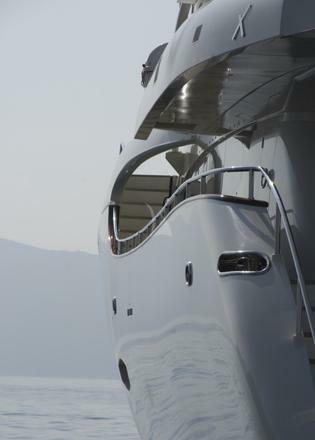 The result is a fast seagoing yacht featuring sleek and elegant lines. PHOENIX has a very modern interior. The owner's ideas have been realized by Metrica to drawings by Birgit Schnaase. Pear wood veneer that is bookmatched is used extensively throughout. 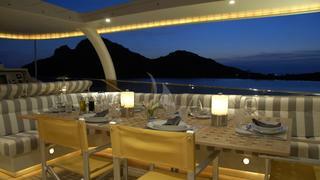 There is a large seating area and dining table on the aft deck. The elegant salon offers comfortable seating. 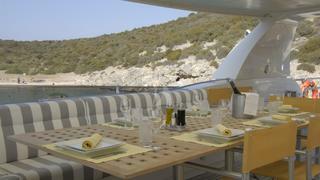 The dining table seats up to 10 guests. Well known brands (Alessi, Rosenthal, Riedel) have been used for china, cutlery and crystal. The top deck is the place where to enjoy outdoor life: large sunbathing area with three sun loungers, jacuzzi, bar, seating area with table, double grill. PHOENIX is built under the survey of and in full accordance with Bureau Veritas rules. The class notation is Maltese I3/3 (E) Yacht/C. In 2015 zero speed stabilizers were fitted.